EMSS Export module : Export order quantity tolerance (in percentage) validation is included at the time of preparing preshipment invoice. Online Global Actual Importer Exporter Directory. No paid entries. Find the correct Classification (CTH/ITC/HS) of your Import Export products. FREE. Live Daily Import Export Trade Enquiries on EXIMON™ E-Commerce web portal. 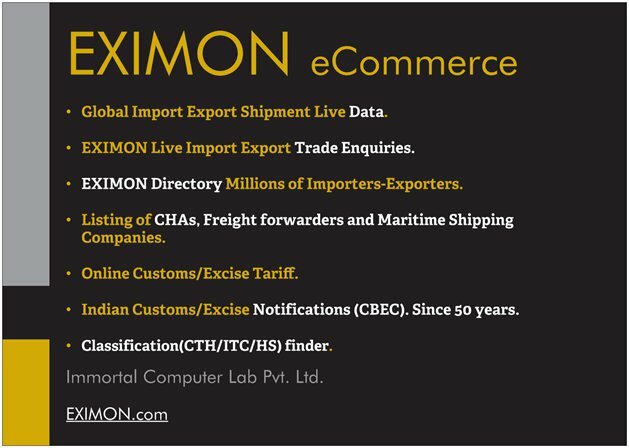 Listing of CHAs, Freight forwarders and Shipping Companies on EXIMON™ E-Commerce web portal. Free LATEST Live Shipment Database of Import Export Goods from Different ports of India (100+ Ports) Daily updates, Pakistan, USA, Russia, Ukraine, Colombia, Brazil, Mexico, Uruguay, Argentina, Chile, Ecuador, Paraguay, Peru, Venezuela and Panama. Data is available since 1997 onwards. Get latest best freight of your Cargo / Container from different shipping companies directly (Free). Offer freight of Cargo / Container from live Import Export enquiries directly (Free). City wise Clearing, Forwarding, Shipping Agencies and Lines.